this is great stuff!! Congrats! Amazing job! How did you solve the ruzzle? Do you use some search algorithm or is a simple greedy search on all the dictionary? Greedy search is so fast (< 100ms) that i not implemented particular optimization. The only pre-optimization is filter world, removing those not contains letters out of the 4x4 grid. This avoid unnecessary research. The entire code is on github, and the search algorithm has a length of ~100 line of code (search, searchWord and searchNeighboard methods). Great job! A very cool mashup of technologies! 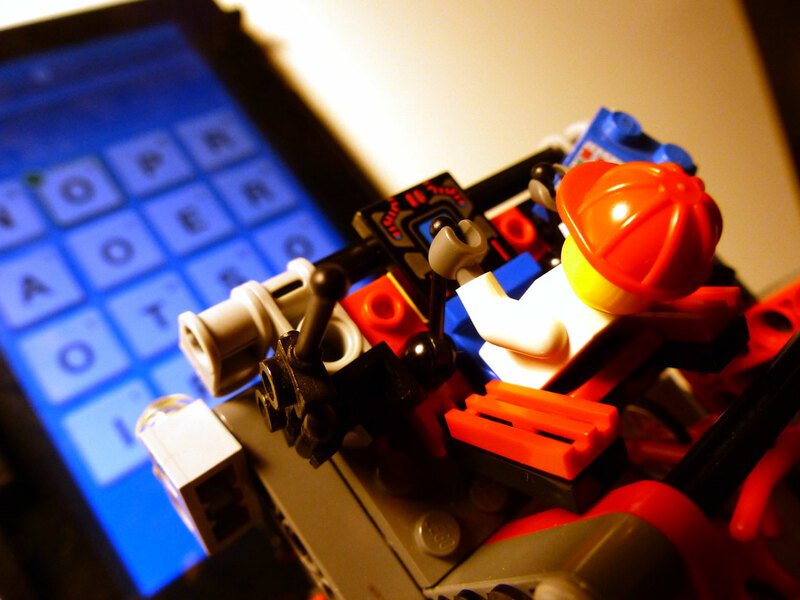 Pingback: LEGO stylus solves Ruzzle tablet game | Daily IT News on it news..it news..
Grandissimo progetto,idea veramente geniale! !poi il video fighissimo. ti stimo!!!!! Very cool project! I liked the video and the music! Tnx for your comment, E ! Awesome project! 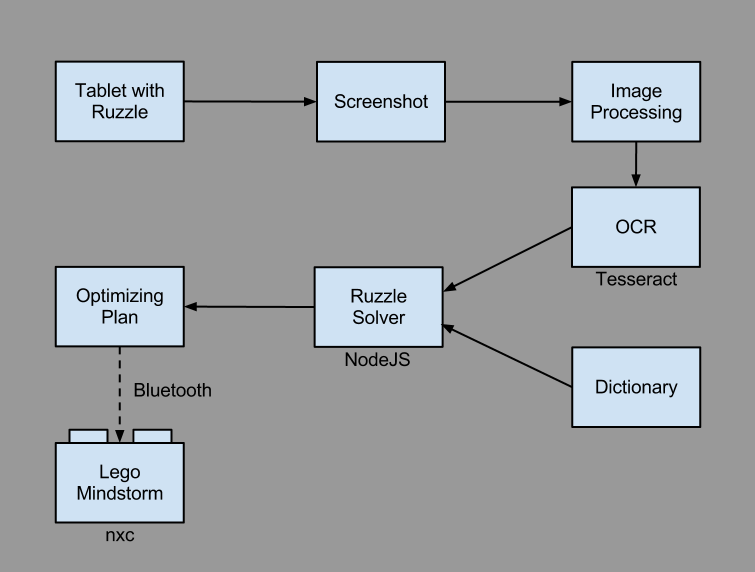 I was curious – how much time does your software need to take a photo, analyze it, find words, and get the Mindstorms to start playing the game? The more time consuming process is make the screenshot, download it, and process image via tesseract (4-7s). The search in the dictionary is fast, very fast. For example, limiting the dictionary to 5000 words, the search process require 52ms to find words and order them. Another point where to improve the performance is the sending over bluetooth: actually the robot wait until the entire plan is received (2-3s). I don’t know Sikuli environment, but i love the automation (i hate any repetitive task), and in future week i publish some detailed photos on how build the robot. The structure behind the motors responsible of movement along x and y axis are modular, and is easy to change the gear to obtain different velociy/acceleration and tune the robot. If I generalize the nxt program to receive coordinate in cm or pixel, instead of coordinates in 4×4 grid, the robot can be used to make real test of any tablet application. Awesome! You make me wonder why I am wasting time in an office rather than spending my days building stuff like this. Please share a video that is a bit more technical, showing the components and real-time video of a typical Ruzzle match, start to finish. I spend my days in the office like you: the robot is made in the kitchen of my apartment (with the permission of my girlfriend), in many nights and some weekend of hard work. In the next week I post more videos and photos of the robot. I confirm that i use my computer to download the screen. I own a Raspberry board (great!) with node.js installed, but I wan to send the plan via bluetooth to the mindstorm nxt, and (I not own a bluetooh dongle connected to the Raspberry). Really nice style and fantastic subject matter, hardly anything else we need :D.
Really cool project! I wonder which tablet do you have? Is it running Vanilla Android or is it rooted? I’m interested to know how to run bash script on my Nexus 7. Is a Sony tablet with Vanilla Android (no rooted): i use ADB to create screenshots, without any bash script on tablet.